What are you looking for useful tips? 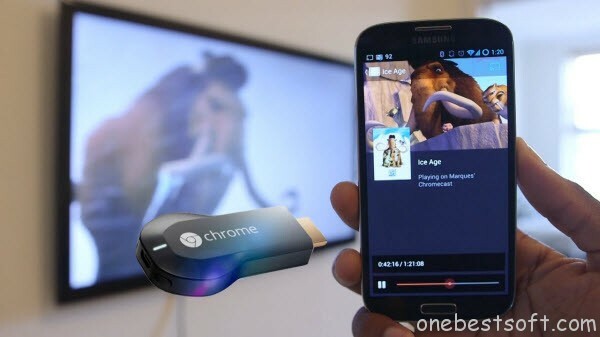 How to stream supported and unsupported video formats through Chromecast? Chromecast is a thumb-sized media streaming device. Set it up with a simple mobile app, then send your favorite online shows, movies, music and more to your TV using your smartphone, tablet or laptop. However, only Google Cast supported formats can be streamed directly. The next paragraph will center on how to stream Chromecast supported and unsupported video formats on your HDTV through Chromecast. MP4 and WebM encoded with Video codecs H.264 High Profile Level 4.1, 4.2 and 5, VP8 and audio codecs HE-AAC, LC-AAC, CELT/Opus, MP3, Vorbis, AVI, MKV, FLV, MOV, VOB, 3G2, etc. M2TS, 3GP, DIVX, RM, RMVB, ASF, TS, DV, F4V, OGV, TOD. Download and open the Chromecast app on your Android or iOS smartphone or tablet using Google Play or the App store. Once the connection is successful, you can play the selected media file on the TV. Note: Please make sure your mobile device is connected to your Wi-Fi and not your mobile network and you must have the latest app installed and be on the same network as your Chromecast digital media player. You can use Chrome browser to stream local video to Chromecast. Just open the Chrome browser on your computer and then navigate to this page to see how to setup Chromecast. After completing the setup, what you need to do is to install the Google Cast extension from Chrome store. Once this extension is installed, you can cast any tabs of your Chrome browser to the TV. To learn how to stream Local Video to Chromecast from Windows/Mac/Android/iOS, refer to the steps here. Directed by the YouTube app from your mobile device, Chromecast pulls the video from the cloud and plays it directly on your TV. You can search on your device without disrupting what’s happening on the TV. Users can build up a playlist of videos, hypothetically creating a video music box from YouTube music videos, or just zoning out on random memes from the web. In order to stream various kinds of videos and movies, no matter MP4, WebM and MKV with incompatible audio or video codecs, or AVI, FLV, WMV, MPG, MOV, OGV, WTV, etc that are unsupported by Chromecast, the most widely used solution is to convert them to Chromecast natively recognized formats. Here Pavtube Video Converter Ultimate is the best choice to do this job. With which, you can convert almost all kinds of video files like to Chromecast supported format for streaming without quality loss. In addition, it not only can quickly convert virtually any video and audio files to all popular video/audio formats and popular devices like the iPad, Android devices, PS3, Roku, Xbox, etc. What’s more, this program comes with a built-in video editor that allows you to edit your movie files by trimming, cropping, adjusting video effects, etc. Mac version is iMedia Converter for Mac. Have any other issues? Find more solutions about Chromecast here. Which Blu-ray Ripper You Should Get? All-in-one video toolbox – Fastest Convert, edit, organize, capture and enjoy any audio, HD/3D/4K videos and DVD/Blu-ray Movies anytime anywhere. The Fastest Blu-ray DVD Ripper and Copier tool, backing up Blu-ray/DVD to multi-track MKV without quality loss, to multi-track MP4, MOV and ProRes. © 2007-2017 Pavtube Software Inc. All rights reserved.